The journal is published electronically twice a year (Spring and Autumn) in English, via EKT’s single electronic journal management platform eJournals. However, articles in Greek and other languages may also be included in special issues at the discretion of the editors. 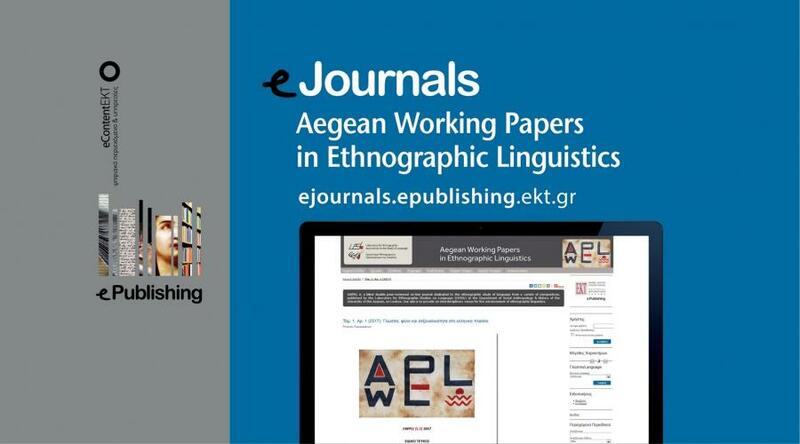 A new journal, AWPEL - Working Papers in Ethnographic Linguistics, has been published by the Laboratory for Ethnographic Approaches to the Study of Languages, Department of Social Anthropology and History, University of the Aegean and is available to readers online through EKT’s eJournals platform. AWPEL approaches the ethnographic study of language from different perspectives and aims to create a scientific forum for the advancement of ethnographic linguistics. Given the revitalised interest in ethnographic linguists internationally, AWPEL has appeared as the first ethnographic linguistics publication in Greece at a particularly crucial moment for the future. The past decade has witnessed intense scientific output in studies concerning issues such as: language and indices, linguistic inequality, language (hyper) diversity [particularly in a globalised environment], identity/heterogeneity and dialectology. AWPEL looks at ethnographical linguistics from different perspectives, accepts article submissions (original articles, data reports, book reviews) on an ongoing basis and highlights issues relating to the above fields. The journal is published electronically twice a year (Spring and Autumn) in English, via EKT’s single electronic journal management platform eJournals. However, articles in Greek and other languages may also be included in special issues at the discretion of the editors. Under this publishing agreement, EKT provides the e- infrastructure while the Laboratory for Ethnographic Approaches to the Study of Languages, Department of Social Anthropology and History, University of the Aegean is responsible for content. AWPEL is a blind double peer-reviewed publication and the editorial board guarantees the validity of published content reflecting the varied backgrounds of ethnographic linguistic research, as well as the international profile and scope of the journal. The first issue coincides with the 30 year anniversary of the Department and is dedicated to the work of postgraduates. It includes 4 interesting articles with language, gender and sexuality in the Greek context as the main theme. The objective of the Laboratory for Ethnographic Approaches to the Study of Languages is to support linguistic research in a Social Science environment through the cultivation of an ethnographical approach to the collection and analysis of linguistic data. It aims to strengthen teaching on undergraduate, postgraduate, doctoral and post-doctoral levels via Working Papers (in English and Greek), specialised library, collaboration with other research centres and academic institutes at home and abroad, seminars, symposia and a summer school. EKT ePublishing (http://epublishing.ekt.gr/en) comprises three platforms, for the publication of journals (http://ejournals.epublishing.ekt.gr), conference proceedings (http://eproceedings.epublishing.ekt.gr) and book-monographs (http://ebooks.epublishing.ekt.gr). These platforms host the content of each publisher (journals, monographs, conference proceedings) and enables the coexistence with other reputable publishers. ΕJournals, as an individual platform of EKT’s ePublishing, hosts high quality open access scientific journals, 31 to date, and offers a single access point to reputable content, strengthening academic communication and research activity. Today, many reputable organisations use EKT’s electronic publishing platform for their transition to modern scientific publications in all stages of the process.